Free kids' craft eBooks are the ultimate resource for parents, grandparents, teachers, and caretakers of all kinds. Each eBook includes a collection of free kids' craft projects and activities organized around a theme, such as holidays, type of materials, age group, and more. You can easily download and print out each book for on-hand reference while crafting with your kids. On this page, find our most recently published eBooks. For help downloading our eBooks, see our help document. Click here to view our full collection of free kids' craft eBooks. Click here to view our collection of Christmas craft eBooks. Click here to view our collection of preschool craft eBooks. 10 Simple Yarn Crafts for Kids - Everybody knows that yarn makes for a great crafting material. But who would’ve thought that our granny’s collection of wound-up wool could turn into an adorable caterpillar or a fun mobile? 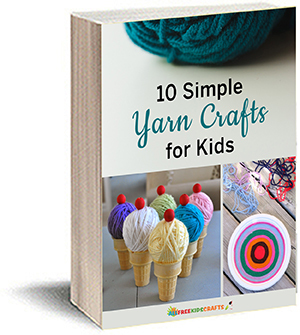 Learn more and download the 10 Simple Yarn Crafts for Kids eBook. 11 Popsicle Stick Crafts for Kids - Popsicle sticks are a classic crafting material that allows children to let their creativity grow. Download this 11 Popsicle Stick Crafts for Kids free eBook for some super fun crafts that the kids will love. 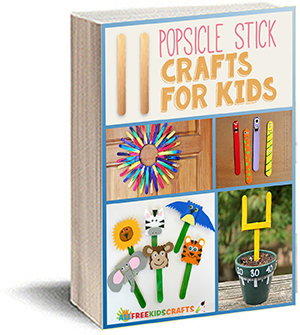 Learn more and download the 11 Popsicle Stick Crafts for Kids eBook. Cheap and Easy Crafts for Kids: 9 Recycled Crafts - Get your crafty kids ready because with recycled crafts for kids, you'll be able to keep them crafting all day long. Your supply of recycled goods is unending and using them to create imaginative, new projects helps the environment and your wallet. Learn more and download the Cheap and Easy Crafts for Kids eBook. See the rest of our kids' craft eBooks here!